Da Vinci’s Workshop. Every shop is a cathedral to its craft. Inspired by the theme, we realized this is the year to share our craft on playa. 2016 also marks the 10th anniversary of the Iron Monkeys and in celebration we want to encourage an important element of our philosophy: anyone can blacksmith. The theme for the event this year is a great opportunity to share our craft and give participants a chance to experience blacksmithing. The acknowledgement of "I too can do" will be shared with others in honor of the craft of blacksmithing. This year we will include the community in our process of creating. Participants will be able to choose a level of participation, be it making a small piece to take with them, or using what they have learned to contribute to the completion of a week-long playa project. 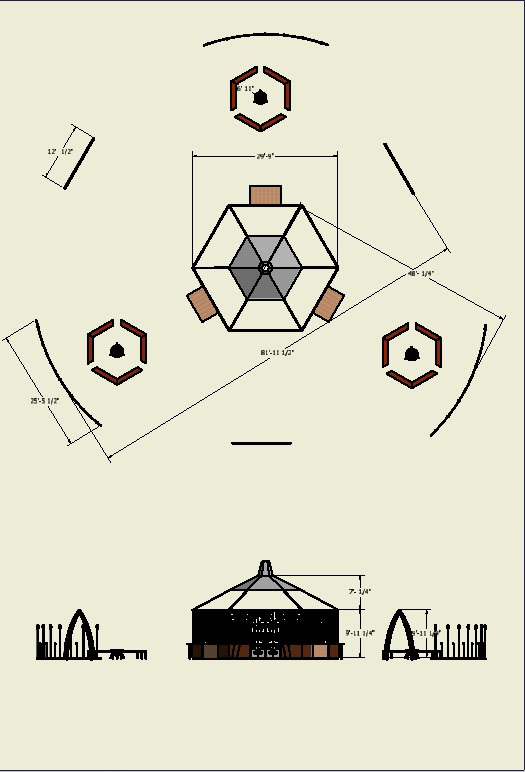 The Perimeter defines the edge of the space, creating a boundary between the Piazza and the rest of the playa. This starts by equally spacing three panels of fencing around the edge of the Piazza. Each fence panel will be made up of propane torches mixed with LED lights. Each night the propane torches will provide warmth and light when the project is active. LED lights will illuminate the perimeter when the propane fire effects are off. Between the three sets of fence panels will be arched frames that throughout the week will be decorated along a unique theme (traditional, modern, organic). Iron Monkeys will work with participants in the Shop to create elements to attach to the arch frames. The arches will also feature propane flame effects along their edges. The Courtyard will be a place to watch the blacksmithing happen inside the shop, to wait for friends, or to just warm up on a bench next to a fire Zen Garden. A Zen Garden is a metal bowl filled with black sand and piped for propane. When lit, flames appear on the surface of the sand in the bowl. Participants can use forged tools to draw designs in the sand and watch fire dance within the drawings. The Shop will be the centerpiece of the Piazza. It will be hexagonal in shape, approximately 30’ in diameter, with steel-framed walls. The walls will be designed to allow an easy and unobstructed view into the shop from the Courtyard. Three of the walls will have doors that open into the shop, while the other three will have a panel that folds outward to make a workbench for cold forming or other clean work. Inside the shop will be a forge and several blacksmithing work stations. Propane-fired lanterns will be hung from each of the exterior corners of the shop. The roof of the shop will be open except for a center roof piece made to mimic a forge hood that will occasionally spew fire. The Piazza di Ferro is, at its core, a functional blacksmith shop. Surrounded by a public courtyard to engage and welcome participants, both shop and courtyard are fully interactive parts of the project, and invite engagement in different ways. The Shop will sit in the center of the Piazza and will be a place for participants to come in and try (or practice) blacksmithing. Equipped with a forge, hammers, anvils, and all the requisite tools and bits needed to be creative with steel, participants will be invited to work alongside and learn from the Iron Monkeys. Personal pieces - participants can choose to make a small item such as scroll pendants, keychains, or playa staples. Participants will be walked through the process of making the item with an Iron Monkey, and will take the item with them when they leave. Community Arch - participants can choose to work on the community project. For this experience the participant will work with the Iron Monkeys to create themed panels in various styles (organic, traditional, or modern) which will be attached to a prefabricated frame as they are completed. Regardless of what path is chosen, each participant will walk away with a new appreciation for and hopefully new skills in blacksmithing . The Courtyard will be a more casual space. Somewhere to sit down and share stories or plan the next destination. Benches will be a crucial element of the gathering space. Three sets of six benches set together in circles will be placed around the courtyard. At any time of day participants will be able to take a seat and share a story, rest, or just reflect. When the shop is up and running folks in the courtyard will be able to see the work going on in the shop. A number of fire elements will entice people into the Piazza and encourage them to stay. Centered within each group of benches will be a Fire Zen Garden. Handcrafted steel tools allow participants to draw fiery patterns in the sand. The Zen Gardens also provide ambient heat for those sitting on the benches. We are currently making a list of tools and supplies we will need for the on-playa shop. Most of the main hardware (anvils and hammers and tongs OH MY) will not be leaving the big shop in Seattle. It needs to stay and be ready for our return to the day to day operations of a Blacksmith Shop. We will also be looking to add some big items and will fundraise for those (such as a small power hammer). We will always take donations (anytime of the year) which you are welcome to send via Paypal.